Internet marketing is an effective method for raising business success to a new level but you can only be successful if people find on your site what they want and for this it is essential that they know that you are out there in the online world. Today there are more websites on the Internet than the world’s population so you cannot expect anyone to browse through all the websites they may find under your keyword. When someone needs something on the web, they simply type in a word in the search engine and then select the one that looks the most promising from the links that come up. You have a chance to increase the number of visitors – and thus your income – only if your website is ranked among the first on the search list of Google/Yahoo. We do our best to increase the conversion rate and the traffic of your website and thereby achieve more online visibility and reputation. However, one service only is not enough for success. Effective online marketing is based on a comprehensive and multi-faceted campaign. Website development: it is important to make your website search engine friendly because it affects your position in Google SERP as well as the number of visitors. Website analysis using website analysis, we can determine how users behave: who your buyers are, where they come from, what they are interested in, how long they stay on your website etc. Using our analytical service you can simply learn how you could make your website even more successful. 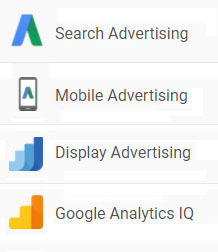 Adwords campaigns: with the help of click-based on-line advertisements, you can reach new and better targeted audience. We undertake the management and optimisation of search, display and social campaigns. Search engine optimisation: Your content is only valuable if people can find it. Thanks to our optimisation service you can get to the first pages of Google. Competitor analysis: we analyse your website’s current situation and compare it with your competitors’ websites. 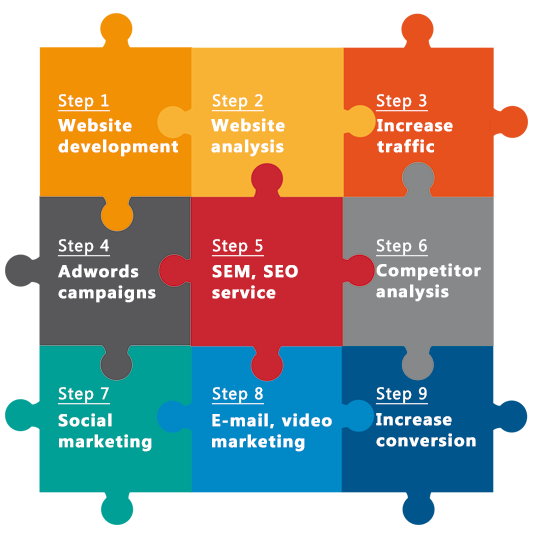 Based on our findings, we can develop an effective online marketing strategy for You. Social media marketing: people will buy from those whom they trust and is there any better means to build trust than social media? Learn how you can improve your website and brand image using social media marketing. Research, increasing conversion rate: if you conduct online activities, you have a tons of available data to choose from. We help you interpret those data and optimise the online marketing performance of your website. Training: Learn more about Google Analytics and Google Adwords. The changes may bring a result in a couple of months: our clients are among the first search results. You can also be there!